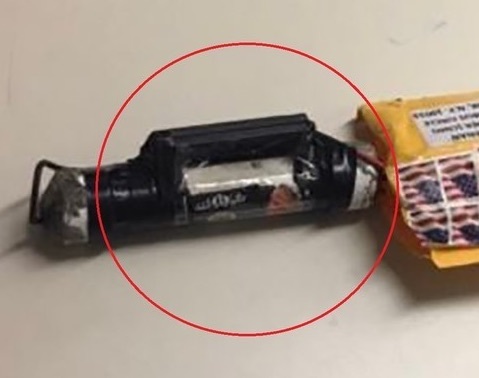 CNN released an image of the device delivered to the Time Warner Center today in New York that forced the building to evacuate. 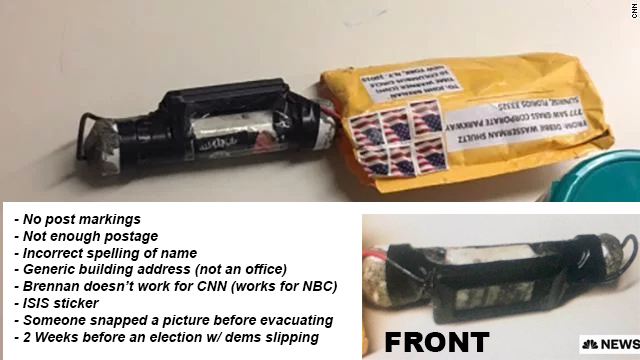 The media is largely consolidating around the theory that these packages were sent by a Trump voter who is lashing out at perceived enemies of the president. An ISIS flag on one of the bombs detonators would of course complicate that theory. How long before ISIS chimes in? How about “Made in Chappaquiddick”? And the chump included no image. Pretty much a total fail. Has anyone noticed that someone had the time to take a photo of the device, that was supposedly active. If it had an ISIS flag, CNN wouldn’t have thought it suspicious. The stamps look to me like the US flag. That’s probably what triggered them and had Don Lemon literally shaking. a pipe bomb sent through the mail that has a return address on it ?????? Really ??? As well, did anyone else notice that there is no postal processing mark on the American Flag Stamps?